Sweetwater, FL – The number two symbolizes balance, but it also brings conflict and resistance. Positivity and negativity are impossible without two sides. That being said, the FIU Panthers head into their 2nd season under Coach Butch Davis with more questions than they had this time last year. In April 2017, we knew who the QB was, Alex McGough. We knew who the lead running back was, Alex Gardner. We knew who the #1 target was, Thomas Owens. We also knew who was the leader of the defensive unit, Anthony Wint. Naturally, you look to the seniors and juniors to fill the voids left by the guys who graduated, or moved on, but sometimes, underclassmen step up to the challenge. Last year’s backup QB, Maurice Alexander, who replaced McGough after he injured himself in last season’s bowl loss to the Temple Owls, is the obvious choice to succeed McGough, but the competition for the starting position is open for business! Conflict. Junior, #8 Christian Alexander finished 7-of-11 for 89 yards. Redshirt freshman, Kaylan Wiggins, made a case for himself when he threw for 8-of-13 for 68 yards, a touchdown, and ran for a game-winning two-point conversion, which capped off the comeback win for the offense. Maurice, however, saw limited play, only completing 3-of-6 passes for 18 yards. I guess Butchy Mane’s seen enough of him. Resistance. The Panthers are deep at running back. They’re lead by last season’s 2nd back in the depth chart, junior, Shawndarrius Phillips, who had six carries for 21 yards. Senior, #2 Anthony Jones (missed 2017 due to injury) and Freshman, Jordan Atkins posted similar numbers. Red-shirt senior, Napoleon Maxwell dominated the ground attack just as his European namesake did, marching for six carries for 54 yards. Balance. I think the clearcut successor to Thomas Owens is Austin Maloney, who had four catches for 74 yards, one of which was a 50 yard catch, almost equalling his longest haul from last season. The problem is that FIU’s going to need more than Maloney to step up if they want to win games this season. Negativity. The defense isn’t as well defined as the offense, but the team is returning a good amount of experienced guys. Coach Davis is asking his players, “who’s going to step up? Who’s going to be the next generation? Who’s going to take the responsibility and the ownership that I’m going to be the leader of my position…?” He also said that “tonight was one of the steps that goes along with trying to create that.” LB, junior, #47 Sage Lewis had four tackles, but Sophomore, #94 Kevin Oliver shined brightest, posting up five tackles, one sack, and one pass breakup. Positivity. 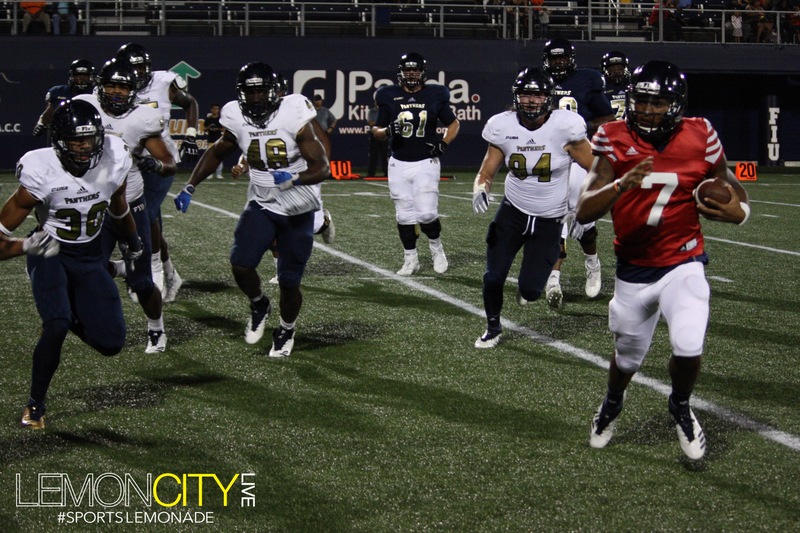 FIU boasts the #1 recruiting class in Conference USA, and returns All-Conference USA players, senior, Jordan Budwig, and Sophomore Bryce Singleton, so it’s easy to be optimistic for the growth of the program. Butchy Mane is! For the full Butch Davis post-spring-game interview, please click below.